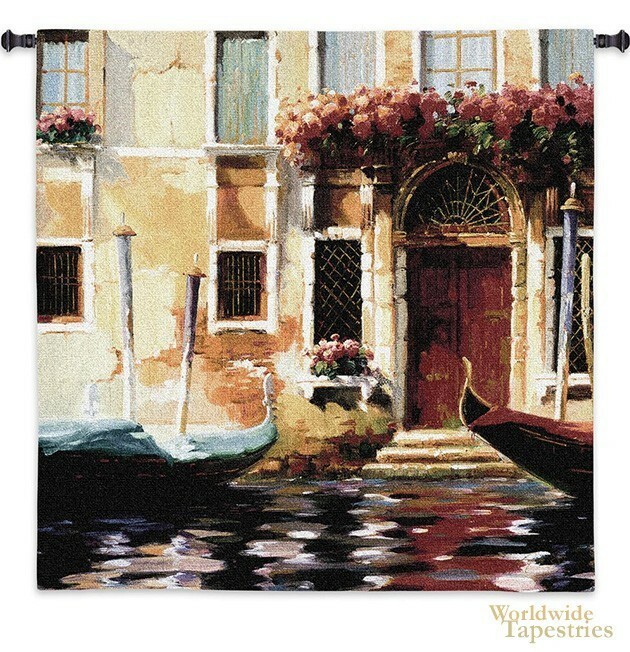 In this tapestry, a scene of 'Venetian Gondolas' along the canal just outside a home on the waterfront beholds us. This design is from the artist Marcelo Silva, well known for his many paintings depicting beautiful, lazy and romantic afternoons on the Venetian waterfront. The gondola is the traditional rowing boat of Venice and has been used for centuries as the transport of choice along the canals to transport people and cargo through the city which is made of is built across over hundreds of canals. Here in this scene, we see what it is like to live on the water, with a handsome deep brown gondola just crossing the entrance of a canal front home, with blossoms displayed on its window sills. The romantic life on the water comes to life in this work by Marcelo Silva. This tapestry is backed with lining and has a tunnel for easy hanging. Note: tapestry rod and tassels, where pictured, are purchased separately.